Alessandro Moreschi (1858-1922) He was the only one to make solo recordings. This photograph was taken about 1880. 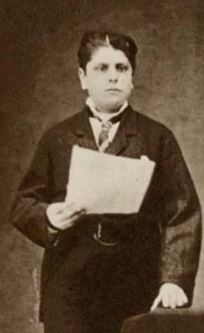 A castrato (plural castrati) was a type of male singer with a very high voice. The effect was produced either through castration, or because of some hormonal problems. The word castrato literally means castrated. Such singers were very sought after in the early days of the opera. Most of the main soprano roles in operas by Handel and other composers of that time were written for castrati. Nowadays they are almost always sung by female sopranos, since there are no castrati left. The practice of castrating young boys who had good singing voices was quite common in Italy in the 17th century. When castration is done before puberty, the usual effects of puberty will not happen. These include the vocal cords enlarging and growing bigger, and the voice getting deeper as a consequence. Even though castration was illegal in many parts of Italy, it was often performed. Many families who were poor had their children castrated because it might give them a better future. Once a boy was castrated he would go to a special music school where children learned singing and musical instruments. The castrati pupils were given special treatment. They were fussed over and kept warm to stop them from getting colds. When they grew up they hoped to become famous opera singers. A few of them had very successful careers in opera. They were the great stars of their day, and audiences came to the opera to cheer on their favourite singers. Those who were not good enough to make a career in opera joined church choirs instead. It is impossible now for us to know what these great castrato voices sounded like, but they must have had very powerful voices and many of the singers were very skilled in singing and adding musical ornamentation to the songs. In the 18th century Italian opera became very popular in England. This was largely due to the German-born composer Georg Friderich Händel who moved to England in 1709 and wrote lots of Italian operas. Many singers who sang in London came from Italy, and many were castrati. The most famous one was called Farinelli. The popularity of castrato singers died out in the 19th century when operas became less artificial and more like real life. By the mid-19th century they were no opera castrati left, although a few castrati still sang in church choirs. The last one, a man called Alessandro Moreschi, died in 1922 aged 64. There is a recording of his voice made in 1902 which can be heard online, but he may not have been a good singer and he was old when he made the recording, so we cannot judge whether the castrato voice was beautiful by that recording. This page was last changed on 29 December 2017, at 06:03.